Hola mis amigos! I'm Papi - full name: Papi Chulo! Mom tells me that means "handsome boy" in Spanish. 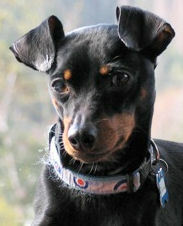 I was born May 10, 2005 in Chicoutimi, Quebec, and now I live with my mom Martine in Victoria. I am big brother to Wii Flee and Sparrow. 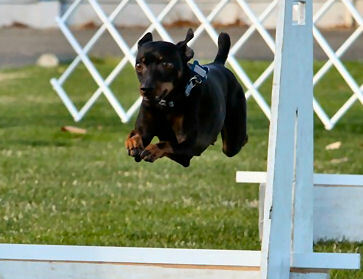 Why did I decide to give flyball a try? Mom was picking me up from daycare one day, and because I could move so fast on my little legs, it was suggested that Mom bring me out. Well, we're all hooked now! After a year and a half of training, I finally made my racing debut, and Mom cried! I'm pretty cool about the whole thing though. My average time is around 6.5-7 seconds, but I recently ran a best time of 5.85! When I'm not at flyball, I like taking my humans for walks around Thetis Lake. I also have play dates with a few of my regular friends, and I love to play ball. I especially love balls that squeak! Oh, and my stuffed rats! I like showing off my tricks too! My favourites are roll over, speak and spin, but I'm learning new ones all the time. Every time they teach me a new trick, I pick it up really quickly! When the day is done, I like to rest on top of the couch where I can survey my domain like the terrier I am.